Are you looking at building a new fence but are perplexed on whether to go with the practicality of colour bond fencing or the raw beauty of timber fencing? Northside Fencing, your trusted timber fencing company have the perfect solution, Termite Buster! What is Termite Buster I hear you ask yourself? Let us explain. Termite Buster is a revolutionary fencing system that combines the elements of steel posts and treated pine railings and palings in a contemporary finish. 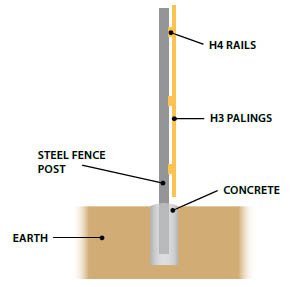 By using a combination of H4 treated timber with steel posts we create a fence that is not only functional and practical, but low maintenance and termite resistant. Other beneficial attributes include longevity and resistance to timber rot. Where Should Termite Buster be Used? As we all know South East Queensland is notorious for its inclement and severe weather and also for the destructive force of termites. The sandy soils of the Moreton Bay region, including Caboolture, Bribie Island and Beachmere and Sunshine Coast are a haven for termites and every year they cause devastation in the millions. You can eliminate worry by doing research into your next fence and make the smart move of having a Termite Buster combined timber and metal post fence erected. You can have the timber look you are after without the hassle. These fences age beautifully and make a smart addition to any home, not only are they functional but they are cost effective and add value to any home, being complimentary to both the classic Queensland style or the more contemporary look of modern housing. Why use Northside Fencing and Termite Buster? The answer is simple, you are having your fence built by the leading North Brisbane fence builder, this guarantees you quality work at the best price whilst dealing with an experienced staff who specialise in all fencing and gate solutions. The final product will be a stylish fence that ticks all the boxes, reliability, longevity, aesthetics and all this at an affordable price. The neighbourhood will be envious and you will never have to lift a finger in maintenance for decades to come. The only dilemma you may have is which colour to paint the fence if you would like something other than the raw timber natural look.